Blake Swihart got a start behind the plate last night for his birthday. Needless to say, he made the most of it. The 27-year-old clouted a solo home run and scored two runs on a 3-4 night—helping Boston to a much-needed 6-3 win over the Oakland A's. The victory halted a 4-game losing streak for the 2018 World Series Champions—and avoided the first 5-game skid since 2015. 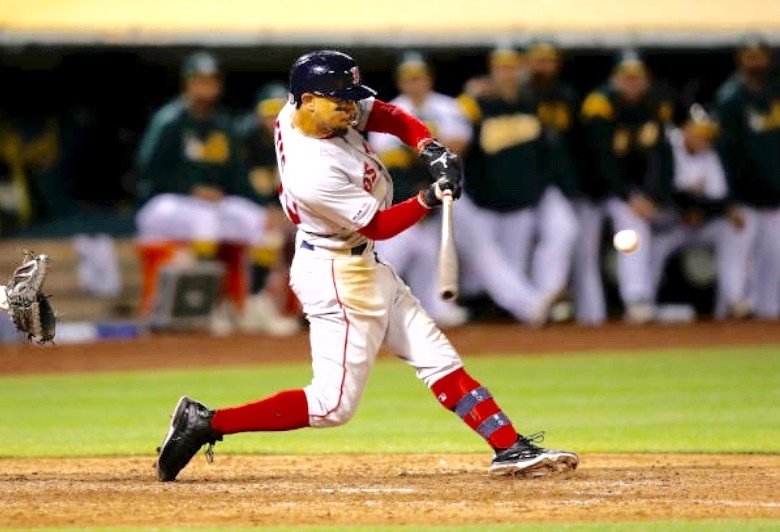 With things knotted at three-apiece in the top of the ninth, 2018 AL MVP Mookie Betts laced a shot off the third-base bag that plated two runs. Andrew Benintendi—mired in a horrendous slump—followed with a triple off the right-filed fence, scoring Betts. Earlier, Mitch Moreland had tied the game with a clutch bases-loaded double. Ryan Brasier pitched a decent ninth to pick up his first save of the year. Matt Barnes had earlier retired four batters. Starter Nathan Eovaldi went five innings—yielding all three Oakland runs—while also walking four. The two teams wrap-up their series with a "get-away" game Thursday at 3:37 PM Eastern time. After that, Boston has three more games in Arizona before ending this interminable road trip and returning home to Fenway to get their World Series rings at next Tuesday's Home Opener.